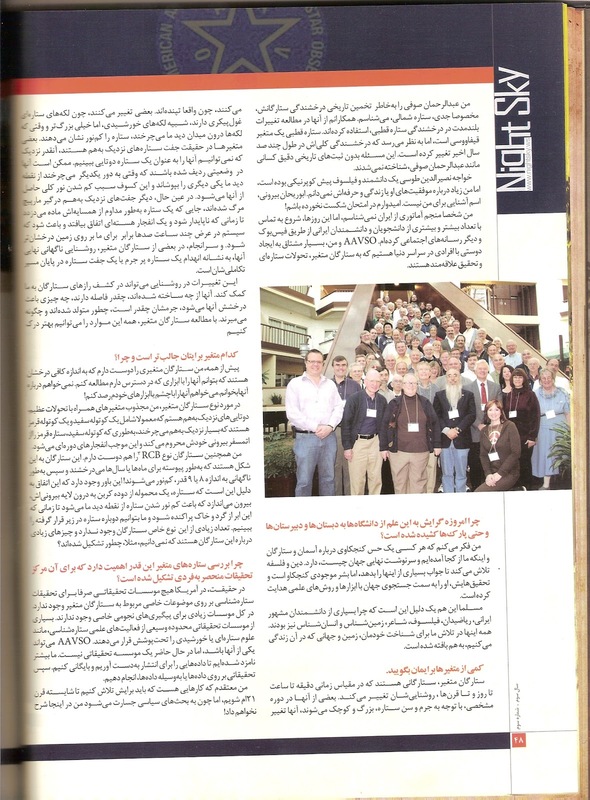 Yesterday I received an email containing pictures of an Iranian astronomy magazine cover and the article pages of an interview I gave several months ago. To be honest, I'd forgotten about the whole thing, so this was quite a surprise. The Night Sky cover and interior pages are very colorful. 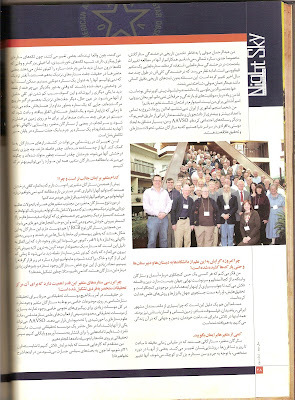 Unfortunately, I can't read Farsi, so I'm not sure what portions of the interview made it into print. They asked questions about the AAVSO, variable stars and my own personal story. They were also interested in how much I knew about their science and astronomy culture and history. I hope I passed the 'Ugly American Test'! It also dawned on me that this is probably why I've had a sudden surge in Facebook friend requests from the Middle East. It's good to know that in spite of our governments' differences, people can still communicate in the universal language of curiosity and the pursuit of scientific answers. Assuming that most or all of the questions and answers exchanged in the interview made it into print, here is the text of the interview I returned to them. Please tell us about yourself and AAVSO. Founded in 1911, the AAVSO is the world’s largest variable star organization, and is the world leader in information and data on variable stars. The AAVSO coordinates, evaluates, compiles, processes, publishes, and disseminates variable star observations to the astronomical community throughout the world. We have approximately 1200 members and 2500 observers from countries all over the world. In 2011, we celebrated our 100th year of collecting and archiving variable star data. I am one of the world’s most active variable star observers. I observe cataclysmic variables and long period variables, like Mira, using my own telescopes and robotic telescopes that are part of the AAVSO’s robotic telescope network, AAVSOnet. 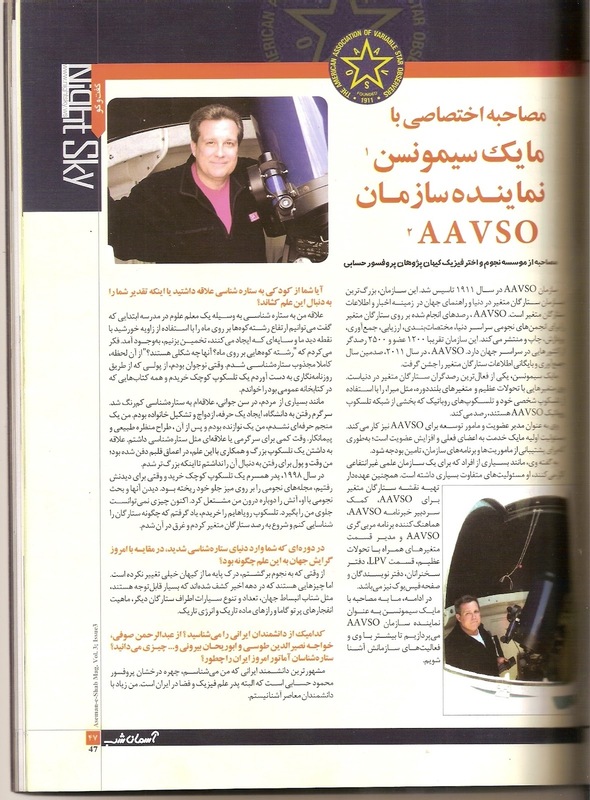 I work for the AAVSO as Membership Director and Development Officer. My primary responsibilities are to serve our current members and to grow the membership, as well as to obtain funding to support the organization's mission and programs. However, like most people who work for a non-profit science organization, I wear many hats. I am also in charge of variable star chart production for the AAVSO, a contributing author of the AAVSO Newsletter, coordinator of the AAVSO Mentor Program, and administrator of the Cataclysmic Variable Section, LPV Section, Speakers Bureau, Writers Bureau and Facebook page. What is the main goal of the association and who are the key member of the scientific committee in AAVSO? to promote scientific research and education using variable star data. The AAVSO Director, Dr. Arne Henden, is the chief operating officer and astronomical representative of the organization. Dr. Matthew Templeton is the Science Director. The other acting science committee chairs are actually the observing section leaders, who are divided among the major different types of variable stars. Were you interested in astronomy from childhood or by chance you got into this field? My interest was inspired by a science teacher in grade school who told us we could calculate the approximate height of mountains on the Moon using the angle of the Sun to our point of view and the shadows they cast. I thought, “Mountains on the Moon? What do those look like?” From that moment on I was completely fascinated by astronomy. I bought a small telescope with money from my newspaper route and read every book in our public library by the time I was a teenager. Like many of us, my interest in astronomy waned as a young adult. I was busy going to university, building a career, getting married and raising a family. I did not become a professional astronomer, I was a musician, and then later a landscape designer/contractor. There was little time for hobbies or obsessions like astronomy. The desire to own a big telescope and contribute to science was buried deep in my heart; I just didn’t have the time or money to follow up on it until I got older. In 1998, my father-in-law bought a small telescope and had astronomy magazines strewn on his coffee table when we went to visit him. Seeing them and discussing astronomy with him rekindled the fire in me. This time it could not be contained. I bought the telescope of my dreams, learned how to navigate the stars, and began observing variable stars like a man obsessed. At the time when you joined astronomy, at what level was the science of Astronomy of the world compared to today? Since I returned to astronomy our basic understanding of the Universe has not changed that much. But there are some things that have been discovered in the last decade that are pretty remarkable, like the acceleration of the expansion of the universe, the number and variety of planets around other stars, the nature of gamma ray bursts, and the mysteries of dark matter and dark energy. Which one of Iranian scientist do you know? How much you know about “Abd al-Rahman al-Sufi” , “Khaje Nasir al-Din al-Tusi” and “Abu al-Rayhan al-Biruni”and... ? how about amateur astronomers? The most famous Iranian scientists I know of is the brilliant Professor Mahmoud Hesabi, who is of course the father of physics and space science in Iran. I am not very familiar with any contemporary scientists. I know of Abd al-Rahman al-Sufi because of his historical brightness estimates of stars, particularly, Polaris, the North Star. A colleague of mine has used them in a study of the long-term changes in Polaris’ brightness. Polaris is a Cepheid variable, but its overall brightness appears to have changed over the last several hundred years. This could not be known without accurate historical records like those of Abd al-Rahman al-Sufi. Khaje Nasir al-Din al-Tusi was a pre-Copernican scientists and philosopher, but I do not know very much about his specific achievements or his life and career. Abu al-Rayhan al-Biruni is not a name I know. I hope I have not flunked the exam! I do not know any Iranian amateur astronomers personally, but I am beginning to have contact with more and more Iranian students and scientists through Facebook and other social media these days. The AAVSO and I are very willing to make friends with people all over the world who are interested in variable stars, stellar evolution and research. Recently the study of Astronomy has been increasing from universities to schools and even public places like parks, can you give me a reason for this? I think everyone has a curiosity about the heavens and the stars and where we came from and what is the ultimate fate of the Universe. Religion and philosophy attempt to provide many of those answers, but mankind is a curious beast and his inquiries have led him to investigate the Universe with the tools and methods of science. This is undoubtedly why so many of the famous Iranian scientists were also mathematicians, philosophers, poets, geologists, and anthropologists. All those things are woven together in our search to understand ourselves, the Earth and the Universe we live in. Tell us briefly about variable stars. Variable stars are stars that change brightness on timescales of minutes to hours to days to centuries. Some of them change because they are actually pulsating, swelling and shrinking in a rhythm determined by their mass and the age of the star. Some vary because they have giant star spots, like sunspots but much bigger, and as these rotate into our field of view they appear to make the star dim. Some variable stars are actually close pairs of stars, so close we can’t see them as a double star. They may be lined up in such a manner that as they rotate around each other one eclipses the other from our point of view, and this eclipse causes a dimming in the total output of light from the pair. Yet other close pairs are entangled in a death spiral, where one star is constantly stealing material from its neighbor until it becomes unstable and a nuclear eruption takes place, making the system appear hundreds of times brighter to us on earth in a matter of hours. And finally, some variable stars are the final flash signaling the destruction of a massive star or pair of stars at the end of their evolutionary path. These variations in brightness can help us to unlock the secrets to the stars themselves. What are they made of, how far away are they, what makes them shine, how large are they, how massive, how are they born and how will they end- all these things we can better understand by learning about variable stars. Which variable stars interest you most and why? First of all, I like variable stars that are bright enough I can study them with the tools I have at my disposal. I don’t want to read about them. I want to observe them with my own eyes or instruments. As far as types of variable stars, I am fascinated by cataclysmic variables, close binaries, usually consisting of a white dwarf and a red dwarf orbiting so close to each other that the white dwarf robs the red star of its outer atmosphere, causing periodic eruptions. I also like RCB type stars. These are stars that can shine steadily for months or years and then suddenly fade by up to 8 or 9 magnitudes! This is believed to be caused by the star belching a load of carbon soot into its outer atmosphere, which dims it from our point of view until the cloud of dust dissipates and we can see the underlying star again. There are not that many of these special stars and there is much we do not know about them, like-how they are formed? Are variable stars so important that they have dedicated research center to study them? There are not really any research institutes in the USA devoted to pure astronomical research on specific topics related to variable stars. There are not a lot of institutes for any specific astronomical pursuit. Most research institutes cover a broad range of scientific astronomical activities, like solar or planetary sciences. The AAVSO could be considered the next nearest thing to that, but it is not currently a research institute. We are more engaged in acquiring and archiving data for dissemination than performing research on or with the data. I believe that is something we should strive to become in the 21st century, but that is venturing into a political discussion I won’t be elaborating on here. As of now, how much do we know about variable stars? What we know about variable stars today will mostly stand up to testing and theories a hundred years from now, but there is a LOT we don’t know. So I would say we have just opened the door and stepped inside, but we have not even turned on the lights and walked around this house yet. Why in Hertzsprung-Russell diagram, variable stars are in the top of diagram? This is factually incorrect. You are referring to AGB stars, but variable stars reside in places all over the H-R diagram outside of the main sequence. Essentially, anywhere stars leave the main sequence they are evolving and most likely also varying in brightness. Even stars on the main sequence vary. Our Sun is a variable star. Variable stars are everywhere, including all over the H-R diagram. How much the destiny of mankind depends on Astronomy and variable stars? I don’t think astronomy or variable star research will cure cancer, stop wars or make governments smarter or more benevolent. But our destiny is out there amongst the stars, eventually, if we last long enough to make that journey. When we go, it will be good to know as much as we can about what is out there, how to get where we are going and what we are likely to find when we arrive. Like every great migration of human beings, it will be an adventure full of discovery and danger, wonder and peril. We will want to be armed with knowledge as well as courage. 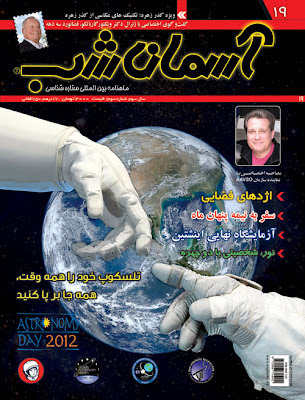 Where do you think our country (Iran) stand in the field of astronomy in 21 century? As I confessed earlier, I do not know very much at all about the current state of research or education in astronomy and physics in Iran. Hopefully, political tensions between our countries and in the Middle East in general will ease to the point I can feel comfortable enough to come visit and find out for myself one day. I would like that very much. Name some of the variable stars that are visible with naked eyes? Mira, when it is at maximum. Betelgeuse, eta Geminorum, Algol, eta Aquilae, delta Cephei (the prototype of Cepheid variables), mu Cephei (Herschel’s Garnet Star), gamma Cassiopeia and of course, once every 30 years or so, epsilon Aurigae, another great mystery. How can a person join the AAVSO? Annual dues are $60.00 US and $30.00 US for students, which is one of the best bargains in astronomy if you consider the benefits of membership in this prestigious organization. I must remind you that you do not need to be a member of the AAVSO to become an AAVSO observer. We have many observers from other countries who are not paying members of the AAVSO, but their valuable observations are included in the AAVSO International Database. You mean you’re not tired of my opinions and me talking about myself yet? I don’t know what else to say! I suppose I should warn you that you could become addicted to variable stars like me. I am a hopeless variable star junkie who must get his photon fix regularly or go mad. If you think you have any weakness in this regard, I caution you to approach observing variable stars with the utmost caution. It can be highly addicting, and the longer you do it the harder it becomes to go back to a normal life. Your last aphorism to us.